Do you drink kombucha? Kombucha is a delicious and healthy probiotic drink. And even better, it’s cheap and easy to make at home! Kombucha can take on many flavors depending on what you choose to add to it during your secondary fermentation. 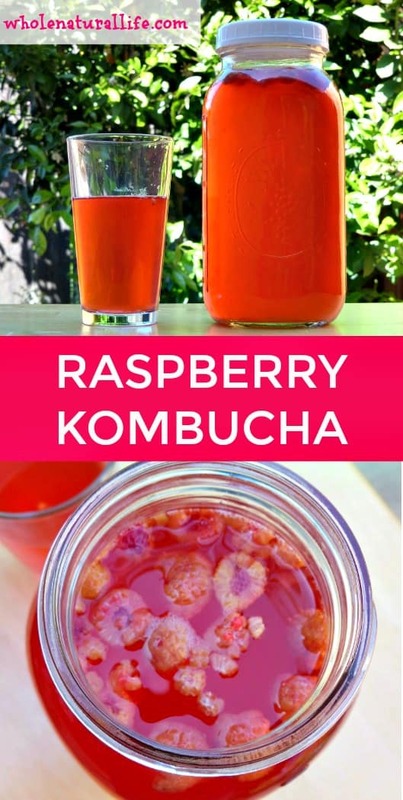 A few weeks ago I shared my strawberry kombucha recipe, so today I thought I’d share another one of my favorite kombucha flavors: raspberry kombucha. When your kombucha is finished fermenting, fill a half gallon jar with kombucha. Add 1/4 cup raspberries. I use frozen raspberries, because fresh are too expensive for me, but I'm sure fresh would work just as well. Cap your jar tightly and store at room temperature. The raspberries will start infusing into the kombucha immediately, but it may take a day or more before they've sufficiently flavored the kombucha. Since the raspberries have a tendency to pour into your cup when you're serving yourself some kombucha, I usually use a spoon to remove them from the jar after a couple of days. Enjoy your delicious raspberry kombucha! You can store it at room temperature or in the fridge. If you leave it out at room temperature, just know that it will continue to ferment and become more sour as time passes. We drink it quickly enough that this is rarely an issue in my house, but occasionally I do end up tossing the end of a bottle because it's become too tart for my tastes. You should also know that eventually a new SCOBY may start growing in your finished kombucha. This is not a problem; just discard it when you're done with the bottle, or earlier if it gets in your way. Don't use it to start a new batch of kombucha--you only want to use SCOBYs from unflavored kombucha. I've been making my own Kombucha for a few months now and I love it! I usually mix it with Zevia soda but this looks so easy I'm thinking I can totally try this with some organic frozen berries! Yum! I've heard so much about Kombucha but never tried it. Does this one taste strongly like raspberry? It looks yummy! Hello. Is there any type of frozen fruit which should not be used for making a fruity flavored kombucha? I've found that it has to be something that transfers its flavor well. I haven't had a lot of success with blueberries, for instance. You'd have to experiment and see what works for you.